*The band Sade began their career 26 years ago with the classic album “Diamond Life” that was a multi-platinum success in various countries including the US. The lead singer Sade Adu, for which the band is named after, has delivered smooth soulful vocals from that first album on. Since then the band has given the world the classic hits “Your Love Is King,” “Smooth Operator,” “Kiss Of Life,” “The Sweetest Taboo,” “Cherish the Day” and many more. Then all of sudden, after 2000, the music stopped. Finally, after ten years Sade Adu and the rest of the band have returned with “Soldier of Love.” Fortunately the CD is worth the decade long wait. The album begins with the smooth song “The Moon and the Sky,” which is an ode to love in its truest form, the one that never gives up. The song proves that Sade hasn’t lost a step. Her voice sounds as pure and unaltered as when we first heard her. The song is reminiscent of her classic “Never as Good as the First Time.” The rhythm is fantastic. For MORE of this review, click HERE. Good Grief! “Queen” when did this happen?. 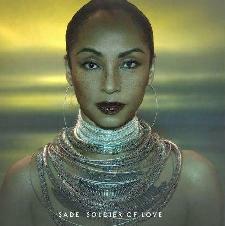 It’s OK, but this is Sade not Nina Simone.